Barb Vietti observes the dry travertine deposits at Hot Springs State Park. She says she has watched the water levels drop over the past few decades. Long-time residents of Thermopolis say the geothermal pools at Hot Springs State Park used to resemble this one, which retains its hot mineral water. The indoor mineral pool at the Wyoming State Bath House, part of a state park, in Thermopolis still offers soakers a free 20-minute dip. Old travertine deposits like this one can be found in a pattern across Thermopolis, suggesting that the springs have moved over thousands of years. A girl slides into one of the hot mineral pools run by a local vendor. Like the Wyoming State Bath House, other businesses also depend upon the springs. Carving into the travertine below Black Sulphur Springs, Chief Washakie of the Shoshone Indians created his own personal hot tub before selling the land to the U.S. government for $60,000 in cattle, cash and food in an 1896 treaty. A rock in Big Horn Springs at Hot Springs State Park reveals past water levels compared to what some believe are ongoing low flows. THERMOPOLIS, Wyo. 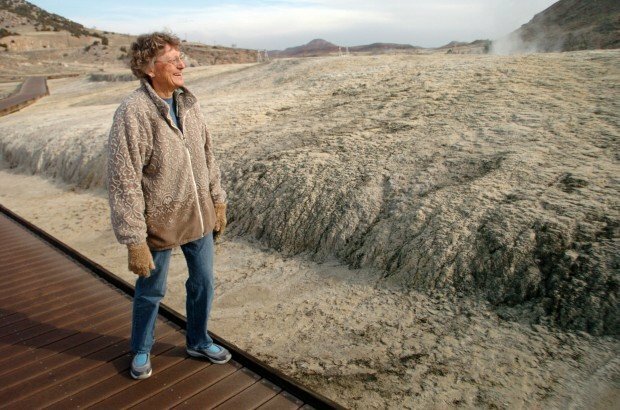 -- When Barb Vietti stopped at Hot Springs State Park on a frigid day this past winter, she saw holes in the river ice and steam rising up from unusual places. Vietti, a retired geologist and a longtime resident of Thermopolis, described it as a curious sight. Save for the holes, the river ice was thick and otherwise solid; the steam vents she hadn't seen before. "I'm speculating that there may have been warmer water beneath the holes in the ice," Vietti said. "I think the next big springs is going to be near the river. It might be 10,000 years from now or it might be next week, we just don't know." Over the past 60 years, older residents have watched changes come to the park and its network of springs. They say the flows are lower and the temperatures have changed, along with the mineral content of the water. Others say the springs are only migrating, just as they have done for millions of years. Yet with no solid answers, the future of the mineral hot springs has become a source of angst for some Thermopolites. The attraction draws 1.4 million people to town each year, and many businesses depend upon the traffic. "It's Mother Nature, and it's going to do what it wants to do," park employee Dave Cathey said. "Some think the springs are migrating down to the river, but if they come out down there, it won't be good for us." Acquired through a treaty with the Shoshone and Arapaho indians in 1896, the hot springs -- promoted as the "world's largest" on highway billboards and in brochures -- remains Wyoming's most visited state park. More than 18,000 gallons of mineral-rich water bubbles up through the springs every day before flowing over travertine terraces hundreds of years in the making. The water emerges from deep underground at a scalding 135 degrees. It's cooled in a pump house to 104 degrees for soakers at the Wyoming State Bath House and other local pools. It's a geological wonder that has attracted humans for hundreds, if not thousands of years. Petroglyphs dating back 11,000 years can be seen just 25 miles up the highway at Legend Rock. In the 19th century, Chief Washakie of the Shoshone Indians carved a depression into the travertine outside Black Sulphur Springs to pool the mineral-rich water. But if Washakie were to return today, he might be disappointed. The springs that filled his personal hot tub with milky blue water are now dry; replaced by a deep black hole in the earth that looks more like the gateway to Hades than a soothing pool. "Our springs have been moving, geologically, throughout the years," Vietti said. "You can follow the progression of these springs through time based upon where the travertine was deposited." That travertine appears to be everywhere, including a hilltop located across town, some 700 feet higher than the state park. Travertine shelves crumble around other dormant springs. A recent count by a high school student found 16 travertine deposits scattered throughout the area, along with four sinkholes and 45 ancient geyser cones. "I grew up here, and in the '50s and '60s and the water level was noticeable higher," Vietti said. "These travertine pools had water in them, but now the water is gone." While the features have gone dry in some places, the earth still belches steam in others. Above the river, an 8-inch crack in the travertine shelf emits a burst of steam. A half-mile away, condensation gathers on the blades of green grass hidden in a steam vent. It's the only green grass around, suggesting the heat rising up from below. The entire park is something of a sieve. Water vanishes in one place only to appear in another. It always finds a way out, just not where some would like to see it emerge. 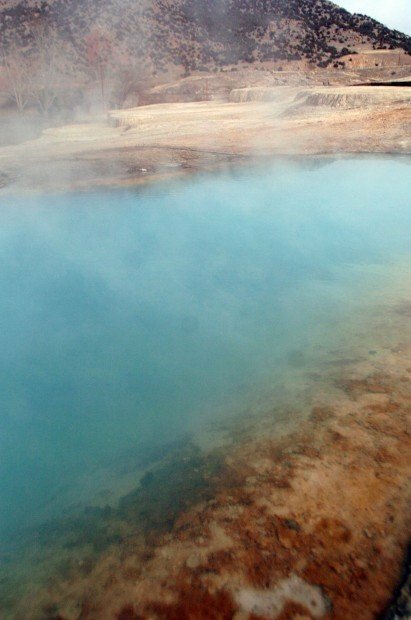 Domenic Bravo, administrator for Wyoming State Parks, Historic Sites and Trails, said the agency put a heat exchanger at the springs five years ago to measure both the temperature and the flow. The state is also working with engineers to look at the impact area wells may or may not be having on the springs. "We know the spring was down last month and is back to normal levels this month," Bravo said. "Historically, it has declined and come back up. The best we can tell is that it has rebounded to normal levels." By normal levels, Bravo means there's enough water to feed to the State Bath House and the other vendors who run mineral pools in the area. "It's something we're trying to monitor," Bravo said. "The last few years have been lower than normal. The work we're doing to monitor this is an ongoing process." Vietti recites the theories behind the recent low flows, and there are many. One blames the changes on blasting done in the 1960s to widen U.S. Highway 20 through the Wind River Canyon. Another theory blames the bubbly demise on the trophy homes and their wells just north of the park; the natural gas and oil drills working the region; or the recent drought. Vietti even names the famous Hebgen Lake earthquake, which rattled the greater Yellowstone region in 1959. It was large enough to collapse a mountain, so who says it didn't adjust the park's geology? "Some said that was the beginning of the springs' decline," Vietti said. "Whenever there are smaller quakes, sometimes there's red in the water. It's a dynamic system and it's always changing." Vietti parks her car on the park's north end and cuts down to the Big Horn River. She points across the water to a smooth wash of travertine, once a favorite haunt to local soakers. "There hasn't been water in there for years," she said. The present springs (along with the travertine deposits left by ancient springs) sit along a crest in the Thermopolis Anticline. Geologists describe this as a fold in the rock. In simplest terms, the fold is broken along its axis by a major fault. A 1982 hydrology study conducted by Bern Hinckley, Henry Heasler and Jon King of the University of Wyoming found that the water feeding the park starts in an aquifer deep underground. The water is confined by impermeable siltstones and mudstones. It flows upward under artesian pressure though faults in the anticline. It's hard to picture what likes underground -- that complicated system of rock layers, ancient formations, faults and aquifers. But for Vietti, the geology goes a long ways in describing what might be happening to the springs. "You can see the fault in certain parts around Thermopolis," she said. "A smaller earthquake might not be on that fault and we may never feel it, but it might be enough to do a little shifting." A little shifting could be enough to choke off the flow of water, or force it to find another path. If it follows another path, as water does, it very well could emerge at the surface at another location; one that doesn't include Hot Springs State Park. "Maybe there's just not as much water in the aquifer," Vietti said. "Maybe the water is there but it's just going somewhere else. "Nobody really knows, so it would be nice if there was a new study to find out what's going on and to document how things have changed." Contact Martin Kidston at mkidston@billingsgazette.com or 307-527-7250. View photos of the waters at Hot Springs State Park.